When it comes to oriental-themed slot games, IGT online slots is the king. Jewel of the Arts casino slot game is a perfect example of this, the game is set in feudal Japan and contains lots of samurais and geishas. The graphical quality is mediocre, not too good but not too bad either. The color of the lotus flower (purple) is heavily used in the interface, and the game has a relaxing look because of this reason. 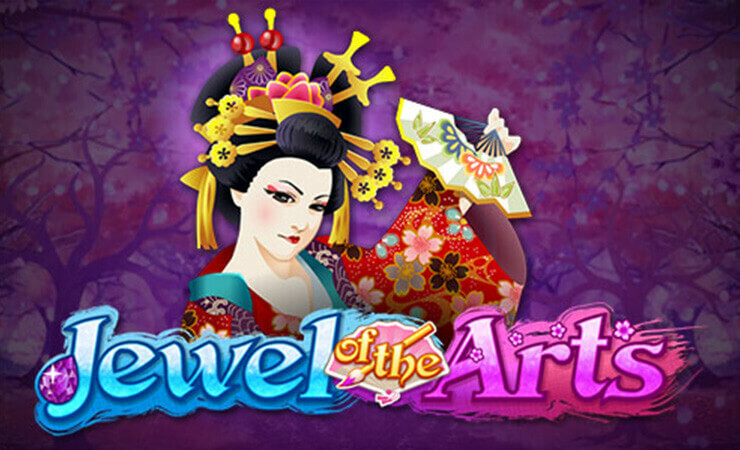 Jewel of the Arts online slot game by IGT contains 5 reels with three slots and 20 pay lines. The low-valued symbols (numbers & letters) of the game are drawn in Japanese calligraphy. The high-valued ones are four in total and consist of pictures of a fan, an artist, a samurai and an origami bird. A picture of a geisha is used as for the wild symbol. The wild symbol can replace any other symbols in the game, except scatters. The scatter symbol is shown with a sign of “Fan Dance Bonus”. It has multiple features. First; if you manage to receive two scatter symbols on reel 3, you get “Fan Dance Multiplier” and a prize of the multiplier of 2x your total stake. Second; three scatters anywhere on reel 3 will trigger the “Fan Dance Bonus Round”. This is the free games round and you are awarded three spins. The number may be a little lower than usual, but the bonuses are good. At first spin, reel 2 will be completely wild. At second spin, reels 2 and 3 turn into wild. And on the third spin, reels 2, 3 and 4 become wild. In other words, almost each of your free spins will result with a winning. There are no other special symbols and features in the game, but the free games system is interesting. The music of the game is also good; so if you like to play casino slots online with oriental themes and soundtrack, this one is definitely one of your best options. The betting range of the game is in between 0.01 and 100 coins. The RtP percentage is a little low (96.08) but Jewel of the Arts is still a nice game in its own category. As always, try the free slots no download version first before risking real money.